Gleann Uisce, 'the glen of water', is on the SE side of this peak. On the NW side, in the townland of Barr na nÓrán, this hill is known as Binn Dubh or Cnoc Dubh. The distinctive green Connemara marble is worked in a quarry in Barr na nÓrán. The quarry was started by Thomas Martin in the 1820s [TR]. 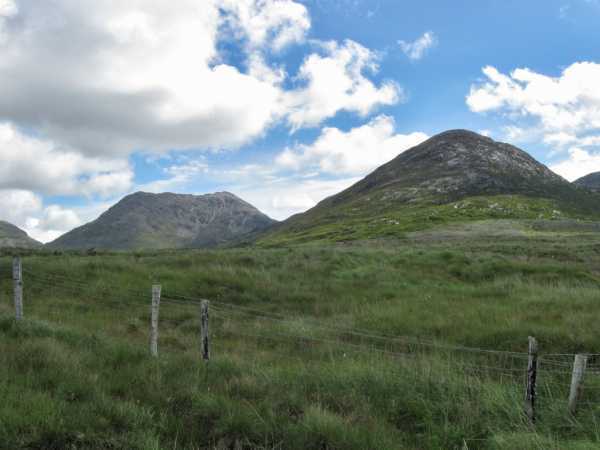 Walks: for a route to the summit, see Paddy Dillon, Connemara, 146-50. Benglenisky is the 516th highest place in Ireland. Benglenisky is the second most southerly summit in the Twelve Bens area. Benglenisky is a good choice of Twelve Ben if you only have the time or inclination to do one, and is easily approached from a minor road to the west. At L75024990 B there is ample parking space on both sides of the road. We continued north along the road for a few minutes till we'd gone beyond the residue of farmed forestry. Stepping off the road, there's a level, but surprisingly wet section before the ground steepens. Plenty of rocky bands on the way up, but these are all easily bypassed.